Ships earlier than expected! 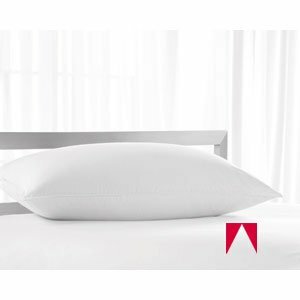 Pillow, Registry, Silver, Deluxe,T200, King, 20" x 36", 30oz, Filled & Finished in the USA #AMERSIL-30-K The King-sized Silver Deluxe pillow by Registry ® is a nice combination of comfort and support. The slick polyester fill gives it a smooth feel, while also providing the pillow with a high profile to give you the support you need. this pillow is good for side sleepers and back sleepers. Specifications: Manufactured by: Registry ® Collection: Silver Deluxe Size: King Size 20"x 36" Firmness: Medium-Firm Fill Ounces: 30oz Fabric: 200 Thread Count 100% Regenerated Polyester Fiberfill, 55% polyester/ 45% cotton pillow shell. Additional: Non Allergenic and Odorless Care: See Tag For Instructions Price includes: 4 King Size Pillows IMPORTANT INFORMATION: The markup on all of our products are very small. We discourage any returns or exchanges due to cost and sanitation purposes (these are personal items) and to minimize inconvenience on your part. In any event, if this is a repeat order, we truly appreciate your loyalty and we are so glad to hear from you again. Your understanding is very much appreciated! Regards, HOTEL AT HOME ILLINOIS, INC. Size: King Size 20"x 36"
Fabric: 200 Thread Count 100% Regenerated Polyester Fiberfill, 55% polyester/ 45% cotton pillow shell. If you have any questions about this product by AMERICAN HOTEL REGISTER COMPANY, contact us by completing and submitting the form below. If you are looking for a specif part number, please include it with your message.